With the warmth of spring, it’s time to move activities outdoors. The kids and I spend hours on our deck when it’s warm (playing in the DIY portable sandbox, for example), so I’m always excited to mix learning with outdoor play. This week we’ve been using a Nature Scavenger Hunt to explore the natural surroundings of our home. 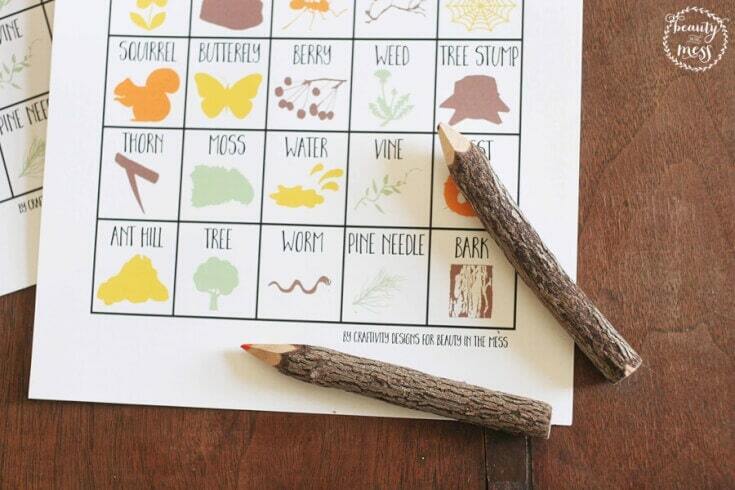 Grab a few pencils, print out copies of the Nature Scavenger Hunt, and head outside. 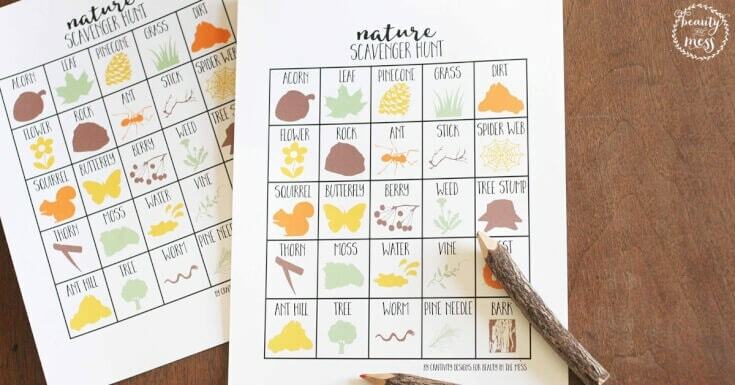 The Nature Scavenger Hunt includes both words and images. So even if your child isn’t reading yet, they can still feel independent as they work on the scavenger hunt. They’ll be able to easily identify the pictures instead of reading the words. If your child is learning to read, use the word and picture combinations to help teach reading skills. Many of the words are simple, and the picture clues will help the child identify the words. Each time an object is found in nature, have the child mark an X over its spot on the grid. They’ll get to see their progress as they mark items off the page. If you’ve got older children, let them compete to see who finds all the items the quickest. 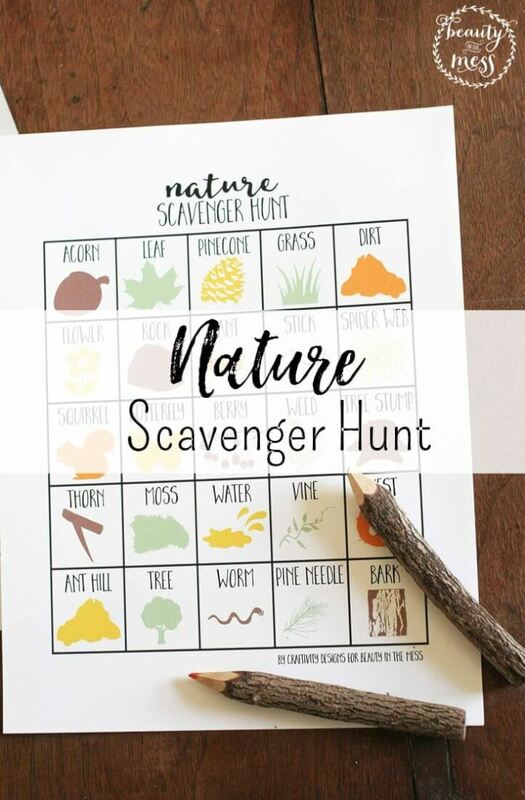 Or take a copy of the Nature Scavenger Hunt on a hiking trip to keep the kids engaged on the journey. You can even keep a few copies in the car for road trips and spontaneous trips to the park! When my son was in preschool, the teacher would take the class on daily nature walks. The kids would head out after lunch, collecting items that they found in nature. Sometimes my son would choose a few blades of grass. Other times, he would pick small flowers or grab a handful of mulch. 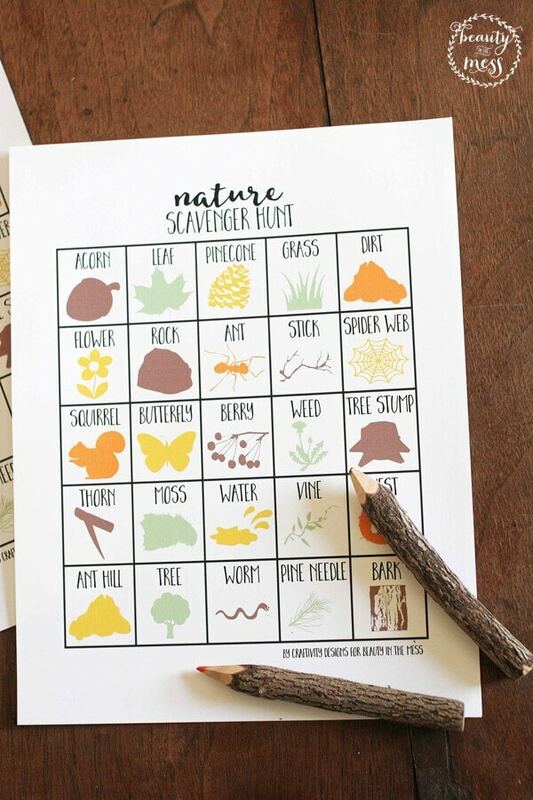 There isn’t any reason this Nature Scavenger Hunt couldn’t include collecting items too. Of course, don’t bring the butterfly home, but let the kids collect items like rocks, sticks, and flowers while on the hunt. 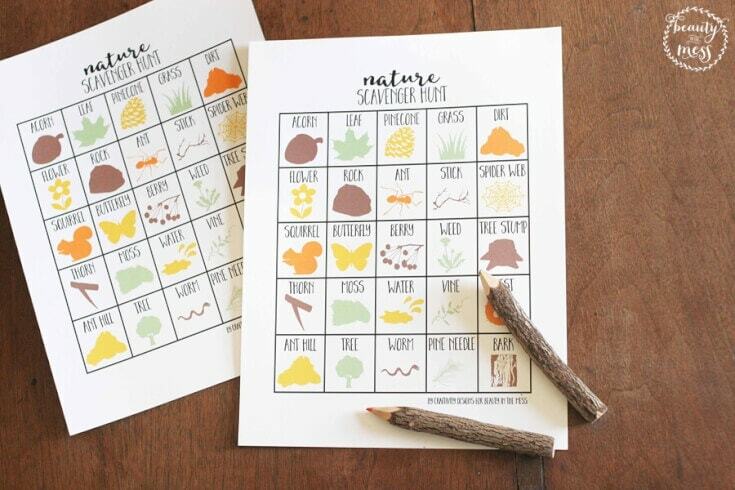 This activity is great for learning about nature, but it’s also a good tool for creating family time. 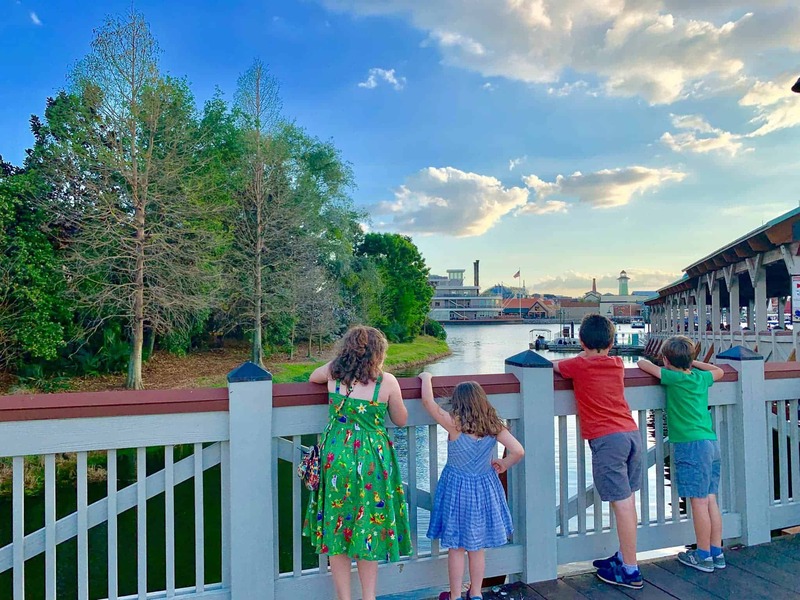 Whether it’s a special activity, or simply during an evening walk, the Nature Scavenger Hunt allows you to work together as a family. Observe nature. Talk about the objects. Challenge each other to search your surroundings. During our scavenger hunts, we talk about how God created the items shown on the list and how they work together as part of the ecosystem. It’s an opportunity to teach them about God’s creation and how it impacts our lives. 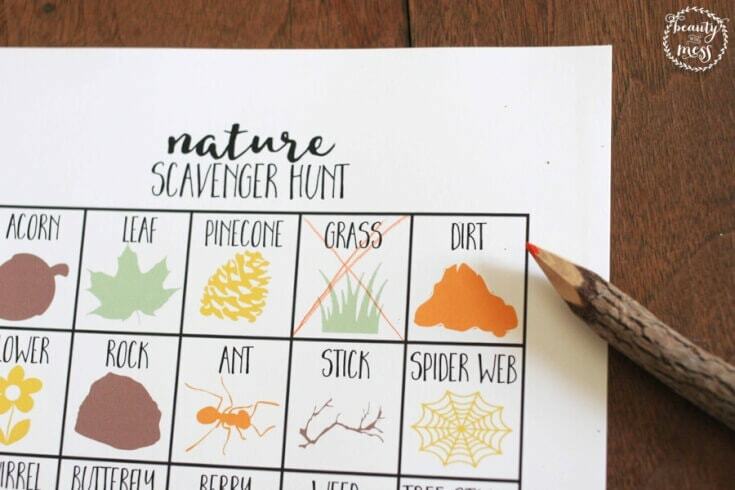 Do you want to take your children on a Nature Scavenger Hunt? 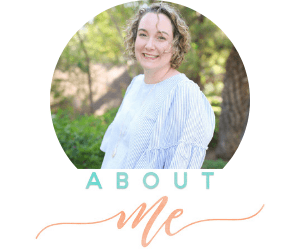 If you like printable activities for kids, check out Yearly Interview Questions, Tabletop Play Mats, and more in my Printable Library. I am trying to print the Scavenger hunt file but it is saying it is unavailable. Is it possible to still access that file? Thanks! I apologize for that, Christy! There was a technical error. It should work now. If you’re still having issues, let me know! Thank you! Hi! I signed up 2x and have not received the download yet, is it still available? 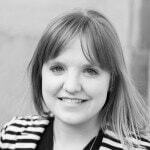 Hi, Rachel! It is available. Could the email with the download be in your spam folder? Email me at whitney@beautyinthemess.com and let’s figure this out. Thanks! I’M HAVING THE SAME PROBLEM. SIGNED UP FOR EMAIL BUT DID NOT RECEIVE THE FILE. I’D LOVE TO USE THIS WITH MY KINDERGARTEN STUDENTS. SUPER CUTE! Hi! Thanks so much for downloading. I just tried it and everything worked as normal. There could be several possibilities with the automatic download – perhaps you tried confirming on your phone instead of a computer. The link is not sent to email, it is an automatic download. Is the confirmation email in spam? Did you confirm that you would like to be added to the email list? Do you have pop-ups blocked on your computer? Thanks so much!